About two years ago, I created this kwote. If you’ve been following my blog, even for a little while, then you know this is one of my personal mantras: Live your life, unapologetically. People generally agree with this sentiment. I mean really, not many disagree that following your heart and doing what you want with your life is a positive way to function. The challenge comes when it’s other people’s lives. Sometimes, we want the freedom to be and live how we want, but we want to confine and judge the choices that other people make about their own lives. Allow people to live their lives unapologetically. I’m not exempt from this. Sometimes I get the urge to share some sage wisdom I learned when I was in a similar situation. I can see the “missteps” people make with jobs, relationships, or children because I’ve been there before. Or have I? I have children, but I’ve never been a single parent. I’ve been married for 20 years, but my marriage is set up quite differently than other married couples’. How can I advise someone of next steps when they are a different person, with his or her own experiences, living in a different time period? I cannot. And I usually do not. Any friend or family member gets the same answer if they ask me what they should do about fill-in-the-blank: You already know what to do. Let that sink in for a moment. You already know what to do. For me, this is true for everyone. I know it may feel better to ask three or four people if you should take the job offer, but deep down, if you’re quiet enough, you will know if you should shift positions. Here’s the question: If you already know what to do with your life, don’t you think the same might be true for your child or brother? Listen. I hate to sound like Polyanna. Trusting yourself and your intuition is hard if you’re used to relying on other people’s opinions. But there’s a beauty in it. Once you’re able to trust your own guidance system, then something magical happens. You’re able to allow other people to live their own lives, without explanation too. *This Monday Note is brought to you courtesy of someone providing me with unsolicited advice about how I choose to live. 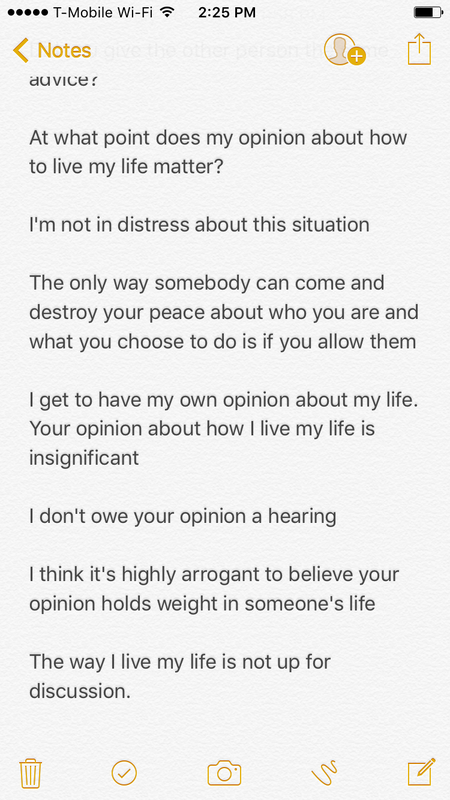 Instead of participating in an argument, I simply wrote responses in my Notes section 😉 Let me know what you think. Sound advice. My sorority sister said something a couple of months ago and it stuck with me. She said “I’m busy living my happy black a** life.” In other words, I don’t have time to allow negativity in my space. I think the problem is that we struggle with what we want to do and what we believe is expected of us. F-ck that. Live your happy black a** life to your best ability. There are more than 6500 ‘full screen’ pictures waiting on you. Please enjoy! I kind of understand what you’re saying. It’s true that when you’re a part of a family unit, then choices do affect/effect the unit, no matter what. I think your questions at the end are important and I don’t see what you’ve described as asking permission, but rather, exactly what you’ve said, making sure there’s support and buy-in. I suppose my follow up question is this: would you follow your heart if you had zero buy-in? That’s where the challenge (for some) seems to lie. I agree that we already know inside. I hold a License in Mental Health Counselor (not currently practicing, now I’m a High School Guidance Counselor) and my favorite theorist is Carl Rogers who believed if you provided people with a space where they felt unconditional love and you provided reflective feedback (meaning re-state to them what they said without putting in your own bias) that people could figure out what they needed to do. That sounds wonderful Wanda! Thanks for sharing this. I’m going to practice using this method. This is a good reminder for me as the mother of four young adults. I need to be careful about offering my opinion even when asked for. It is their life and I sure don’t want to be responsible for their incorrect decisions. I’m enjoying dropping by. I like the way you think. Loved this. Just went back to link this to an earlier post on a similar subject [Advice and Boundaries]. My pleasure. Same perspective from BOTH of us! You Darling, are a force to be reckoned with. I love your strength and not needing validation from anyone. Fantastic post but they always are aren’t they? You know this right? Nod….. 🙂 Missed you and I’m catching up on some blog reading now my sweet! Have a great rest of the week! It’s a balancing act, I guess, because there are times when our opinions and experiential wisdom ARE wanted. Or times when someone is sharing something of value but its cloaked in a know-it-all tone and we don’t want to hear alla that! So many great things to consider, here: about allowing, about giving and receiving counsel, about trusting one’s intuition. Well, I know where to come for some lively discussion! Yeah…that last part about the “know-it-all tone” lol That’s the part I’ve learned people can most especially keep to themselves. Yes.Yes. Yes, Leslie. I think many of us want to save people from the mistakes we’ve made, which I’ve also learned is a type of fear. We fear they’ll be in that rabbit hole, like we were, and so why not offer the path out? lol you can thank Mr. Dwight Garland Jr for that one 😉 He’s often the recipient of my venting and while I was explaining the situation that set me off, he nodded in agreement and said these words verbatim, “This is not a court…I don’t owe your opinion a hearing” lol To which, I replied, oh yep…I gotta write that down. I think this is true of me; I know what I want or need, but still look to others for opinions on occasion. Typically I still do what I want though lol! I’m surrounded by people like you who can seek, listen and do what they want anyway. I’m still working on not listening at all when it comes to small decisions. Major things though? I won’t even ask anyone’s opinion. Great advice. I need to apply this to some people. I think the challenge also comes, when your ‘dream-life’ crosses the paths of other persons lives/life (hm, what is the correct spelling?). Yes, you should follow your heart, pursuit your dreams, however also take your neighbors in consideration and you know what I also believe; that voice inside is sometimes your heart, sometimes your head…but always wise to listen to it. Thanks Patty! You know I totally agree about that voice in your heart. You cannot go wrong if you listen to it 😉 Sending a hug right back to you! Following your mantra of self reliance for decision making seems to be the epitome of courage. I expect that living alone would make such a prospect much easier. lol living alone is hardly possible for me. I have developed some techniques, like not revealing my next project until it’s finished or ignoring people’s unsolicited advice and proceeding with my first mind/thought. I kind of agree here with what you’re saying Kathy, but :), I also feel that for a huge majority of your life, you don’t actually know how you want to live your life [if that makes sense]. I think that’s why mentoring and bouncing ideas off others (especially respected and more experienced others) is really helpful at different stages of your life. OK, when you get to our age (lol), you pretty much know what works and doesn’t work for you, and you can deal with/accept the consequences of what might have been a wrong decision. And you’re not quite as tolerant of what you might perceive as interference from others. People with not the same life-experiences and maturity can flounder with life’s challenges and I think well-timed and sought for advice can be pivotal in deciding how to move forward. I welcome advice, especially if I know it’s well-meaning – I don’t always feel I have to act on it, but it can be thrown into the mix and enable me to make a clearer decision on a life-style choice. I do agree though absolutely on allowing people to live their lives – but where I find this difficult is in the case of children (young as well as adult-children), that I am so emotionally involved in their well-being, that I’m afraid I largely don’t take my own advice of letting them do so. It’s so easy to want to live their lives for them when you see them making horrible mistakes and you don’t want them to suffer. My daughter summed this up really admirably recently when she said ‘ …I want to make my own mistakes …’. So yes, although I don’t want her to make painful mistakes, it is not my place to tell her how to live her life. “Emotionally involved” is the best description of parent/child relationships. I totally get that because we’re so involved and invested, so to speak, we sometimes feel as if it’s ourselves who are going through the situation. I’ve had to learn how to reign back with my own daughters, who are only 15 and 18. I remind myself that it’s not me and once upon a time (like last week lol) I wanted someone to allow me to forge ahead and walk the path I saw for myself. It’s hard to watch, but it’s true. Your daughter and many others want the same. I think this lesson is best learned as a parent. I grew up feeling very controlled about the choices I made. And now that I have children, I realize how important it is to allow them to make their own choices – even though at times I’ve been uncomfortable. I share how I feel – only because I care for their safety. But in most areas I feel better letting them find their way. Yes, I think we know what to do if we’d only listen to that little voice. I can hear it holler at me while I take the wrong road. But I usually turn around. Aha! Yes. That’s what it is sometimes…validation that they’re doing the “right” thing. I think it does because when you say, “here’s what I would do,” then it’s based on your background, fears, etc. It’s challenging not to give any advice or opinion, but it usually works. Hi. You know, I’ve never thought about this before. Not too much, anyway. Off the top of my head I’d say that generally you’re right on the money. But I think there probably are times when someone might be receptive to advice and opinions — to help them clarify situations. I’m thrilled that I offered a new thought Neil! (no sarcasm here, I really am excited about that). So I think what you’re saying is similar to what Joan mentioned (either ^^^ or below). A lot of times people want validation for what they might already know to be right for them. Hello, dear Mrs Garland 🙂 As usual, a thought provoking post about real life and accountable living. I think it is all about freedom, freedom of being who we are and freedom of letting others be whom they are or want to be. Nothing is possible without freedom and the liberty of being on our own terms and the liberty to expect nothing in return. Thank you Iulia! Accountable living is a great phrase for it because that is what this promotes, being accountable for the choices we each make. It absolutely is about freedom and I think when people try to force their opinions on to me, it feels like the opposite, restriction in a little tiny box. Absolutely agree with that last sentence/sentiment. I love this perspective. What you wish for yourself is also true for others. Having no judgement for other people’s choices gives freedom for everyone to live unapologetically. Enjoyed your post very much! What I love about your blog is that the thoughts and topics you write about are immediately applicable. I happen to have switched my life up a lot this year and it’s pretty scary. So far I have completely followed my gut, even when my gut didn’t explain itself. I just figured I craved a change, so no matter what fell in my lap (like jobs I didn’t really want but provided easy routes), if they repeated experiences I already had, I would need to ignore them. That has been harder than I thought! I don’t know if it’s just the conditioning females receive or my own family training or my personal desire to please others, but it’s very difficult to keep following my own road (especially when I am putting the stepping stones out in front of myself as I go). The notion of living without apology is a powerful reminder for me–I need to keep on keepin’ on and make my own path. I just accepted a part time job that will test me in new ways–it isn’t a consistent hours, it doesn’t pay particularly well, it is at the edge of my comfort zone, but my gut said, hey, try this! Thanks so much for those kind words! I’m glad that’s true for you (and others). Wonderful reminder this morning. Thank you :-). Hiya K. I am very much of the same sentiment as yourself. I think where I go wrong is when living for myself affects the people closest to me. Sometimes, the things I want to do are fun me but have consequences- not always good.